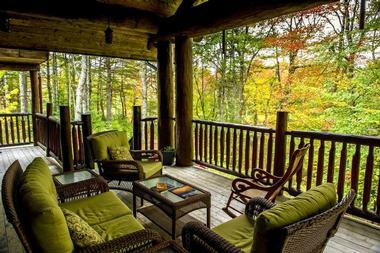 Located in the heart of the Tobeatic Wilderness in southwestern Nova Scotia, Trout Point Lodge is a quintessential wilderness lodge and nature retreat that offers luxury adventure travel and ecotourism getaways. Situated just 40 minutes from the Yarmouth International Ferry Terminal, and three hours from the cosmopolitan city of Halifax, Trout Point Lodge offers a unique eco-destination for exploring and enjoying the Canadian backwoods on Canada's east coast. Trout Point Lodge features luxurious accommodations in the form of hotel rooms, suites, and cottages that boast spectacular river views, award-winning local market cuisine, and acclaimed wines, and an array of outdoor recreation and activities. Surrounded by 100 acres of woodlands bordering the scenic Tusket and Napier Rivers and remote Tobeatic Wilderness Area, Trout Point Lodge is an easy drive from the beautiful beaches and coastline of the Bay of Fundy, historic seafaring ports, and beautiful French Acadian villages. 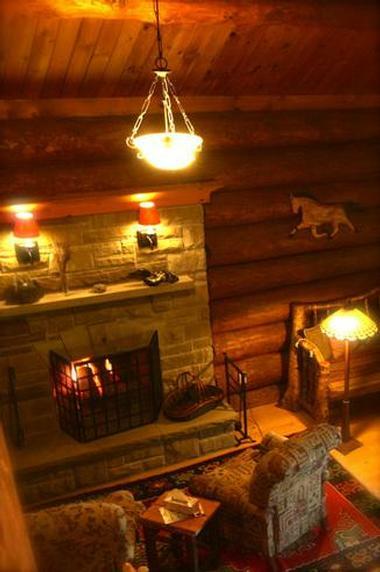 Trout Point Lodge features a variety of accommodations in different locations ranging from seven luxurious junior suites and one suite in the main riverside lodge, three extraordinary guest rooms in the secluded Beaver Hall, and a charming two-bedroom cottage on the edge of East Meadow Lake. Celebrating the early 20th-century camps that were once erected along the U.S. & Canadian Eastern Seaboard, Trout Point's main lodge is an architectural masterpiece built from giant Eastern Spruce logs, chiseled granite and sandstone. 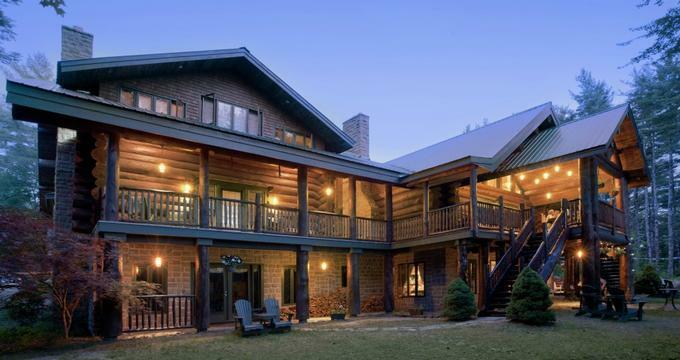 The three-story structure houses seven Fireplace Junior Suites and one Granite suite, each of which has high beam ceilings, log walls, hand-cut stone fireplaces, and private porches or patios. The romantic Fireplace Junior Suites boast double or queen-size beds with deluxe linens, en-suite Italian tiled or slate bathrooms with deep soaking tubs, walk-in showers, and L'Occitane en Provence bath products. Spacious sitting areas have plush wool carpets, wood-burning fireplaces, original V. Cottreau furniture and French doors leading onto private porches or patios with covered outdoor seating and beautiful views. 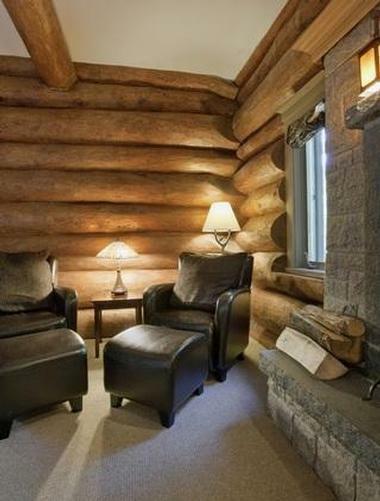 The Granite Suite in the Main Lodge offers the most luxurious accommodation with black slate floors, high log beam ceilings, blue granite walls, and a red sandstone fireplace. The gorgeous riverside suite features a beautiful queen-size canopy bed with deluxe linens, a marble en-suite bathroom with separate double shower, claw-foot bath tub and L'Occitane en Provence bath products, and small stone patio sitting area. 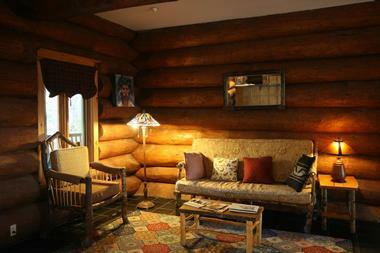 Other suites found in the Main Lodge and Beaver Hall includes the Burlwood Junior Suite, Treehouse Junior Suites, and The Acadian Junior Suite, all of which feature similar décor and handmade log furniture and carpets, original artwork, and handcrafted wood walls. All rooms and suites feature modern amenities such as individual climate control, direct-dial telephones, and CD/iPod music players, hair dryers, irons and ironing boards, flat screen DVD players (on request from reception), and a daily maid and turndown service. The kitchen at Trout Point Lodge serves award-winning cuisine created from fresh and locally sourced ingredients, organic produce, hand-picked herbs, wild foods, and sustainable seafood. Each dish is made from scratch using the freshest seafood and meats, vegetables, greens, edible flowers, and herbs from extensive on-site gardens and accompanied by 170+ selection wine list. In addition to luxurious guest accommodations and unpretentious gourmet dining, Trout Point provides an array of excellent facilities, amenities and outdoor activities to enjoy. Surrounded Nova Scotia's beautiful Acadian Forest ecosystem, including lakes, rivers, marshes and glacial formations, the Lodge borders two rivers and lies next to the Tobeatic Wilderness Area, which forms the heart of the UNESCO Southwest Nova Scotia Biosphere Reserve. Amenities and activities at Trout Point include pampering massages and body treatments, kayaks, and canoes, fly fishing gear and excursions with an expert guide, mountain bikes, floating docks and swimming platforms and wooden boardwalks and nature trails. Trout Point also features wood-fired riverside hot tubs and a riverside cedar barrel sauna, guided hikes into the Wilderness Area, star-gazing, food forays, and fishing and casting lessons. Cooking classes can be enjoyed on most afternoons, and the Main Lodge features an array of guest facilities, including a mezzanine library, fully equipped kitchen, dining rooms, two bars, and the Great Room. Trout Point Lodge borders two rivers, namely the Tusket River and the Napier River, and lies next to the Tobeatic Wilderness Area, which forms the heart of the UNESCO Southwest Nova Scotia Biosphere Reserve. Surrounded Nova Scotia's beautiful Acadian Forest ecosystem, the Lodge offers a variety of guided excursions and outings including hikes into the Wilderness Area, kayaking, canoeing, and paddling lessons, star gazing, fishing and casting lessons, food forays, and exciting 4X4 trips.